ChildChild age: 12 years and yonger. In continuous operation for more than 60 years, the Gulfstream IV has been transporting anglers to some of Key West's premiere deep sea fishing spots. 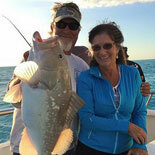 The half-day party boat charter includes bait, fishing rod, tackle and license. The vessel has a large enclosed cabin and plenty of deck seating as well as his and her restrooms and a well-stocked snack bar. Whether you are fishing for the first time or are an experienced angler, each passenger will have a rewarding and memorable expedition. Boat Fun for the Whole Family! Gulfstream IV is Key West's Party Boat! 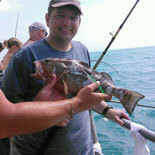 The waters off Key West are teeming with a variety of sport and edible fish species. The crews of Gulfstream Fishing, Inc. know their favorite haunts. The company's philosophy inspired their motto, "Catch Fish and Make Customers Happy." Climb aboard this 58-foot U.S. Coast Guard-inspected Gulfstream IV party boat for an incredible deep-sea fishing adventure. 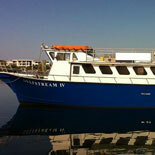 The vessel has a snack bar and restrooms. Exemplary personal service awaits each person who endeavors to land dinner or a prize catch. Departing daily from slip number 8 on Key West's historic charter boat row, the half-day party boat limits the amount of travel time so that anglers have more time trolling some of the best fishing grounds off Key West. The friendly courteous captain and crew will gladly assist first time anglers and seasoned anglers catch fish while having fun in the sun. 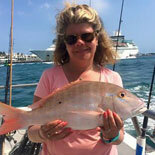 After landing your prize catch of snapper and grouper, you can release it or have it cleaned for dinner. Amaze your friends with the size and number of your catch. Daily trips from 10:00am to 4:00pm. Please arrive at 9:30am. North Roosevelt Blvd and Palm Ave.
Child Ticket: 12 years and younger. Seniors Ticket: 60+ years. + Reservations are required at least 2 days in advance of desired tour date. To cancel for full refund, you must cancel 24 hours before your trip. + It is not uncommon to travel 2-15 miles away from shore. They do try to keep the travel time under one hour to maximize the fishing time. They will sometimes fish in as deep as 120 feet or sometimes as little as 20 feet. These depths are sometimes relatively close to each other. They fish where the fish are. + The crew will keep track of what you catch with their special marking system. + After the trip, the fish are sorted and you can have them cleaned for about $0.50-$1 per fish. + The galley is open one hour before departure and has a wide variety of affordable snacks and drinks available for purchase. You are more than welcome to bring your own small cooler. Single handled, no wheels preferred. + If you have any doubt about being seasick, they recommend taking a seasick tablet the night before your trip. This will allow you to sleep through the drowsiness effect while preventing the seasickness.